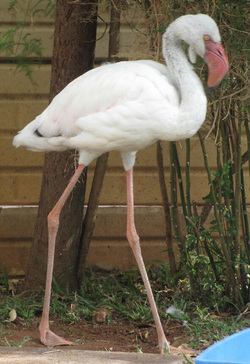 All the way to the Northern Cape - Kimberley, the town of diamonds & flamingoes. We were welcomed by the NCFSCC committee as guests and three Independent shows followed in the same hall after the completion of their SACC show on the 12th of April 2014. This was our third triple show event and the AICA show was once again followed by the OSRBG's 9th show. A SACATS Ring show ran at the same time as the OSRBG show, in the same hall. Hills sponsored the prizes and their friendly & enthusiastic representative was there to inform and advise about the New Hills products, recently launched in South Africa. Each judge could award one "Judges Best" only. We were privileged to have four visiting judges from Gauteng. The Best Overall was a lovely Persian Black Silver Shaded. Congratulations, Stuart & Charles! We were privileged to have an example of the rarest and newest breed of cat on show, for the first time in South Africa and probably the first time outside of the USA. 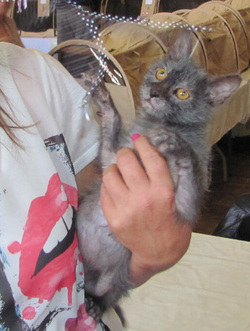 The Lykoi was a great hit with public, judges and exhibitors alike. The SABC featured the breed and the shows on the TV2 and TV3 Newsbulletins on the same evening. She is a great ambassador for her breed and we commend Suzette van den Berg for bringing the breed to South Africa. We wish you all the success for the future of the breed. Thank you to all the exhibitors, judges, stewards and especially our hosts for making this a memorable weekend. Thank you, Theresa Fouche for the studio quality photographs.